SNOW!! Perhaps you have had enough of the white stuff, or you are enjoying the winter activities snow enables. Regardless of your attitude, dedicated crews remove snow from our roads so we can travel safely. 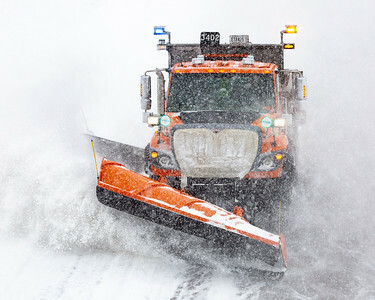 For a few years, I have been visualizing an image of snow plows, snow flying off their plow blades, rolling down the highway. Last week, the elements of this image finally converged. 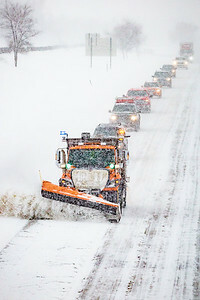 On a snowy Wednesday morning (Feb 20) I positioned myself at the right place at the right time to capture Minnesota Department of Transportation (MNDOT) crews clearing I-35 in Lakeville. I would like to remind you--winter is not yet over. 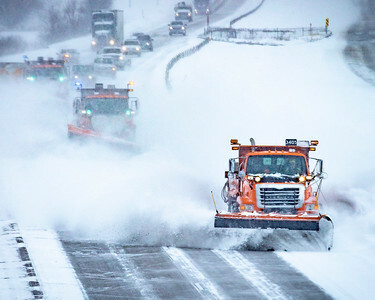 Please drive carefully--turn on your headlights and maintain a safe distance from the plows. DON'T FOLLOW SO CLOSELY!!! 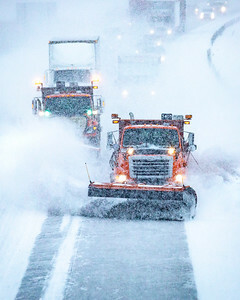 Notice how closely the vehicle immediately behind the plow is following--you can only see the top of the vehicle and not its headlights. I-35 Northbound lane looking south from 195th St; Lakeville.